I’ve been rather less active in promoting Brickvention (Australia’s premier LEGO convention) this year, entirely because I’m rather sad to not be going this time around. But I would be terribly remiss if I didn’t remind all our Melbourne readers that it’s coming soon (19th and 20th January 2013 to be precise) and you need to book your tickets ASAP. In my experience each year gets bigger and better and since the last one was super fun I’ve absolutely no doubt this one will be even more excellent. Sadly exhibitor and convention tickets are sold out so if you’re not already booked in you must go as a visitor. And I cannot stress enough that you need to book your tickets in advance and that the event has entirely sold out each recent year. 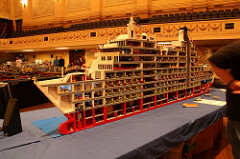 Brickvention is an Australian based convention for LEGO® fans. 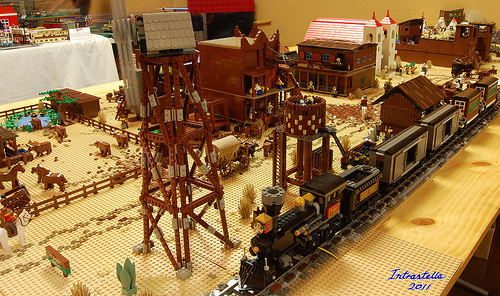 It is a two-day event that brings together LEGO fans of all ages from all over Australia to view original and unusual creations built by Australian modelers and collectors. So if you love LEGO, come along and view the amazing creations and models made out of LEGO. 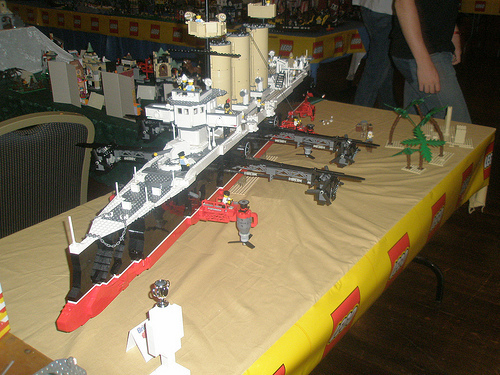 The event features a huge collection of LEGO models including trains, castles, pirate ships, Star Wars™, space ships, planes, buildings, sculptures and many more. There will also be competitions, face painting and LEGO sets and merchandise for sale. 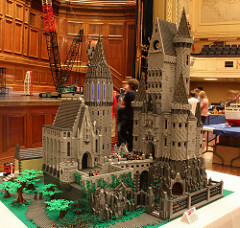 The next Brickvention will be held over the weekend of 19th and 20th January 2013 at The Royal Exhibition Building, Nicholson Street, Carlton, Victoria, where anyone can come along and view the amazing creations made out of LEGO. LEGO fans of all ages are welcome on the Saturday and Sunday from 9:30am – 5:30pm. I’ve just returned from Melbourne where I attended my third (maybe fourth…) Brickvention. Each year this convention gets bigger and, more importantly, better. A huge thanks to the organisers for making it such a great event. For those who could not attend here’s a selection of some of the great creations that were on display. Or of course you can find your own by wading through the tags or Brickvention group. 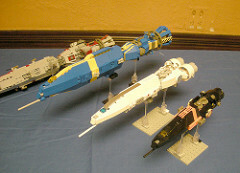 And if you took photos please remember to add “Brickvention” and “2012” to your tags and submit it to the group. Mark Curnow (Brickton) brought this utterly amazing version of Bumblebee from the new Transformers movies. This thing was incredible, both for size and detail. It was funny coming up to it from behind where it looked like a jumbled bionicle creation (with no offense to the great bionicle builders out there) but from the front you realised the jumbling was 100% truth to the source material. 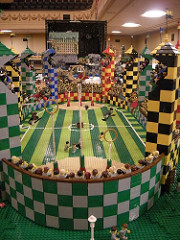 With full stands and an incredible minifig selection, Jennie Sasson bent walls to capture the geometry and activity of a Quidditch tournament. Her use of 3D for the players gave the tournament a wonderful feeling of action. The Canberra LUG brought along this wonderful rollercoaster using the old blue track. Watching it zip around the track was a pleasure. I know David Boddy has some great videos of the show too. I have to admit I missed Travis Matheson’s ‘Nova’ ships at the actual event, but having spotted the pictures now I really regret it. Some excellent microscale love. And of course these are merely a few of the many great models and displays that the 10,000 audience members got to see. We’ve already seen Ryan’s rocket and I’ll blog Mike Pianta‘s and my creation later. PS. Excuse the messy pictures. WordPress hates this sort of layout for some reason. And I hate taking too much space or boring you with excess words to fill space. Thanks to an excessively busy patch in my life it’s been a long while since I blogged anything LEGO. Unfortunately this probably won’t change much for a little while at least. But I felt I should take a few moments to remind everyone that the public tickets to Brickvention 2012 are selling out fast. So if you want to come see Ryan McNaught’s Apollo 11 (and a bunch of other good stuff) you should book soon. 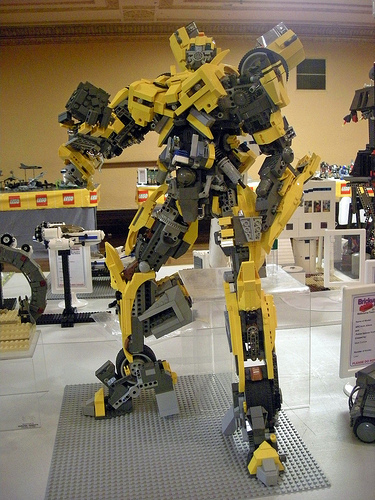 As I mentioned in my last post I spent last weekend (14th to 16th) enjoying myself at Brickvention 2011. This year is was significantly larger than last year with 140 AFOLs attended and 8000 people through the door on public day. In order to deal with an increasing number of attendees (last year there were 3000 through the door) the event had moved to a bigger venue but with a three-fold increase in attendance it simply wasn’t enough. Sadly many people had to wait two hours to get in and some were turned away at the end of the day. The event seems to be approaching the size of some of the smaller European and US fests. But I suspect our readers aren’t too interested in statistics compared to pictures. After giving attendees a weekend to get their pictures up there are now a bunch of photos up on flickr (check the BV pool and BV 2011 pool or appropriate tags). My absolute favourites were the steampunk ship Hyperion (top) by Darren Reid and the Sydney club’s Western display (bottom). Much to my chagrin I spent most of the public days building and didn’t get to see many of the smaller models but I did get a quick moment to wander around and check out the bigger models so can also recommend Ross Crawford‘s crane (right), Kevin Hall‘s Drachenberg castle, Ryan McNaught‘s The Love Boat (left) and Hogwart’s school (left) by David Scalone. But there was numerous other great models around the place. I certainly look forward to Brickvention 2012 whenever and wherever it may be. If you’re in the region this event just gets bigger and better each year so do come along. And many, many, many thanks to the organisers. They put in a lot of effort and ran a very tight ship. Once again it is Summer and that means it’s time for Brickvention. As Australia Day falls on a Wednesday this year Brickvention breaks from its usual tradition of falling on the long weekend and will be held from the 14th to the 16th of January instead which hopefully means cheaper flights and accomodation. Registration is now open so if you haven’t already started planning your trip now is a good time. One other notable change is that this year it’s in the all new venue of Melbourne Town Hall due to the enormous crowds at last years event. Brickvention is the premier convention event for the Australian LEGO® Community. 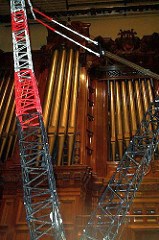 Brickvention is a 2 day event for AFOLs (Adult Fans of LEGO®) Like other conventions, it offers workshops, presentations, special events and challenges. The event celebrates the coming together of the fan community that has evolved as a result of the Internet and exploring and developing the LEGO® hobby. 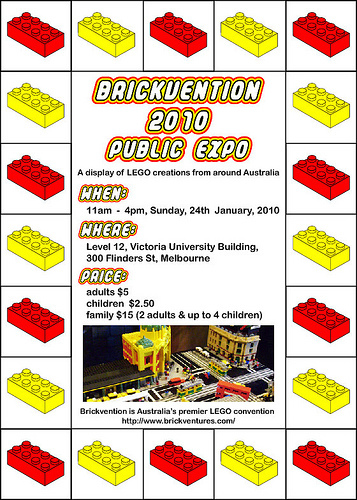 Brickvention occurs annually on or near the Australia Day weekend in January. Brickvention 2011 will be held on Saturday the 15th and Sunday 16th January 2011. 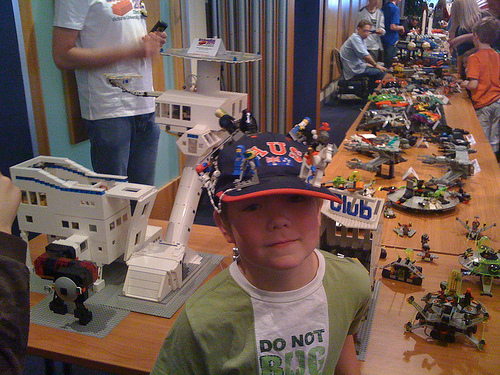 The Saturday is for registered attendees and is aimed at Adult fans of LEGO®. Sunday is the Public Day where everyone is welcome. Saturday the 15th includes sessions intended for AFOLs (Adult Fans of LEGO®) 18 years of age or older. Younger convention attendees are welcome to come with a registered adult, but keep in mind many of the activities outside of the Public Expo are targeted toward adults. Sunday the 16th is the Public Expo, allowing the general public of all ages to watch LEGO® builders at work and view LEGO® creations and displays. – registration is not required for the Public Expo. Convention: Saturday the 15th includes sessions intended for AFOLs (Adult Fans of LEGO®) to get together and discuss LEGO®, building techniques, models etc. and includes a number of events such as presentations and competitions. – Please register for these competions prior to Brickvention. Public Expo: Sunday the 16th from 10am – 5pm is the Public Expo, allowing the general public of all ages to watch LEGO® builders at work and view LEGO® creations and displays. Registration is not required for the Public Expo. If you’re in the neighbourhood I highly recommend attending. It’s by far the biggest AFOL convention in Australasia. I’m already fully booked. The above image by batwingtm will take you to the flickr group which also includes pictures from previous Brickventions. I’ll add more links as I find them. Well I’ve just got back from Melbourne after attending Brickvention 2010 and having a little holiday. I’m very tired so will keep this brief but I felt I owed it to our readers and the 70 Australian who attended (plus the 2800 people that came to see!) to blog something from the convention before the week was out. I took no photos myself (camera had a dead battery and they always turn out bad anyway) but there’s a bunch of them up on Flickr now (alternate link to search on Brickvention 2010 tags). PS. Below is the best in show award winner. I’ll be blogging more about it ASAP. I’m sending out a pre-Christmas reminder that the previously mentioned Brickvention 2010 is coming up fast so get registered if you want to participate in the Australia Day weekend. So far Brickvention has people registered from all six states and a final full attendence of at least 50 is expected as well as a predicted 2000 people through the door on the public day (it was crazy last year). If you’re from Australia or the neighbourhood this is your best chance to catch up with a bunch of LEGO fans from the local region. I’ll be there for the whole time so drop by and say hello. Just a 16 day reminder about Australia’s own convention. And remember it’s on the Australia Day long weekend so if you’re planning to visit Melbourne for it book your hotels about now. Australia’s LEGO convention, Brickvention, is just a few weeks away and it is now time to make that all important decision about attending the event. The weekend of LEGO-filled fun happens over the Australia Day Long Weekend (January 23rd – 25th) in Melbourne (Australia). This is the third such event in Melbourne and looks like being just as exciting as the previous years. Even if you can’t make it to the whole weekend, the display area is open to the public on Sunday and we’d love to see everyone there! A heads up for all those Australian LEGO fans out there. I plan to attend and hope to have a blast. 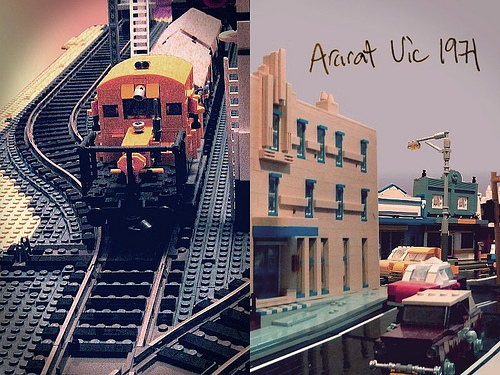 Brickvention is Australia’s own LEGO convention and it’s only a few months away! 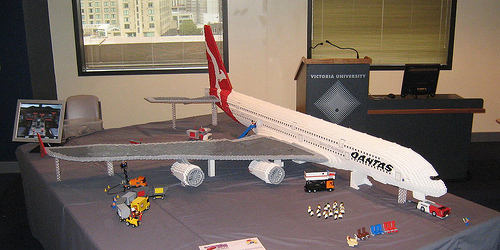 The 2009 Brickvention will be held over the Australia Day Long Weekend (January 24th to 25th) in Melbourne, Australia and promises to be an exciting event. Following on from the success of the previous years, there will be competitions, presentations, demonstrations and lots of interesting things to see and do. We’re all really excited about the event and can’t wait to meet lots of other AFOLs from all over Australia and around the world.